“Bend to Fit” shoulder girdle is hand formed to conform to the patient’s shoulder at the correct forward alignment of the head and neck. Flexible thermoplastic upright should heat molded 30° “ahead” (towards neutral) so that when applied, the brace will “flex” into the contracture providing a “stress – relax” neuro-inhibiting realigning therapeutic stretch. Device is best used while seated or upright. Orthotic therapy for mild to severe Torticollis of the head and neck. The flexible upright will “give” with an involuntary episode of tone. 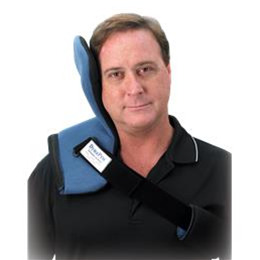 Excellent for treating lateral neck contractures for patients with spasticity. Effective treatment to restore normal alignment to the head and neck. Device is best used with the patient seated or upright. The DynaProÔ Torticollis Orthosis has a “Bend to Fit” shoulder girdle that is hand formed to the shoulder with the device aligned so that the flexible upright is centered on the head. A shoulder strap is secured to maintain device orientation. The thermoplastic upright should be heat molded 30 degrees “ahead”, so that when applied, the upright flexes into the head and neck providing a therapeutic stretch. The unique flexible properties of the device will facilitate muscle inhibition to predispose the affected joint(s) to the benefits of Low Load Prolonged Stretch (LLPS) provided by the orthotic. By increasing wearing time to three to six hours per use, the Total End Range Time (TERT) of device wear allows the Muscle Spindle to re-set at a greater resting length, providing long effects stretch and permanent increases in joint range of motion over time. The device should be modified by heat molding the upright as needed every 4 to 6 weeks to continue contracture reversal. Orthotic treatment should be continued until the contracture is reversed. It is recommended that the device is used to improve head and neck ROM to at least 20 degrees past neutral for best results. Child DP TO-C (Left or Right) 4" - 5"
Youth	DP TO-Y (Left or Right) 5" - 6"
Regular DP TO-R (Left or Right) 6" - 7"
Large DP TO-L (Left or Right) 7" - 9"
My facility really likes to use this orthotic for positioning during meal times. Because it supports the neck, the patient is in a better position during meal time. We had one patient that was able to look up and see his surroundings because of this orthotic. Give it a try, you will be pleased.